Was just finishing lunch at Pearl's Place with a couple of people yesterday when the ever interesting Pigmon tuns my way and asks if I'd like to go to the oldest hot dog stand in Chicago. Oldest hot dog stand? Yep, seems he and the amazing ReneG were out and about the other day and ReneG asked him the same question and, if anyone in Chicago is going to know the oldest currently operating hot dog stand, it's going to be ReneG. Al's Red Hot is stunning in its urban simplicity. Hard by the El tracks. Not all that inviting exterior. Leads to a tiny space dominated by bullet-proof glass without even a chest high rail to perch a hot dog on. You might get the impression the folks at Al's are unfriendly, but the opposite is true, welcoming, joking with each other and the customers,even posed for a picture for which they let me poke my camera through the bullet-proof glass. Al's hot dogs/polish, like Al's itself, is of the minimalist school, good quality natural casing hot dogs/polish and no poppy seed steamed buns, though they do use iridescent bright green relish and fries included with, and in the wrapper. Pigmon had a polish, I had a hot dog, which I thought excellent. Nice snap, subtle flavor hinting at sweet, which I've found only on the rarest of occasions, which to me signifies a perfectly cooked hot dog. We split a decent hot dog stand style burger, though it was marred by the sticky processed cheese product and sampled the included fries. The fries have good flavor, but not great texture. Limp, not greasy, but simply limp. At 54 years old, which was the final answer we got from the busy staff, Al's is going strong, I hope it lasts another 54. Our first stop, Pearl's Place, deserves it's own post. Short answer, very good fried chicken, tasty soul food entrees and sides, friendly, efficient service in a large comfortable room. Great post -- and I love the pic of Pigmon, gazing at the unprepossessing exterior, clearly a man on a mission. I'm sure I've blasted past this place hundreds of times (coming back to Oak Park from the loop, I frequently opt for the Mister Toad's Wild Ride feeling of riding under the Lake Street El). Condiment distribution on Polish is very odd; why congregate relish and onions in the center? Aesthetically pleasing, it makes no sense from a functional standpoint. Next time, I'm on Lake headed home, I will drop by. G Wiv wrote: The fries have good flavor, but not great texture. Limp, not greasy, but simply limp. Gary and I speculated that the fries were most likely cooked in an oil that was clean as well as hot enough not cause serious oiliness. I believe the "limp" -ness' was because they simply didn't cook them long enough. The two times that I've eaten there, this was the case. Nonetheless, as Gary says, these fries do have good flavor. If you're bold enough, you might shout behind the bullet proof window "cook the fries a bit longer............please?" Polk and Western, which beth and I frequent semi-regularly, has fries that are always totally limp, but otherwise have huge potential. They're also usually a bit greasy. I've taken to ordering the fries 'crisp', just like I used to at Parky's. It doesn't help as much as it did at Parky's. The fries are still a little limp, but they are vastly improved. David Hammond wrote: Condiment distribution on Polish is very odd; why congregate relish and onions in the center? Aesthetically pleasing, it makes no sense from a functional standpoint. I agree that there is an increased risk of condiment slippage and loss with a Central Condiment Pile (CCCP) method, comrade Hammond, but the wisdom of this approach seems intuitively obvious to me, as it permits one initially to experience the flavor and texture of the dog without the distractions provided by condiments. Stage two, of course, may demand condiment repositioning. In any case, I'm making a place for Al's dogs in my new 5-year plan. I am disturbed by your disinclination to distribute the wealth of condiments more equally, as I am by your seemingly individualistic turn of mind. Let us hope such tendencies are corrected before they prove an embarrassment to yourself and the party. I first learned of the significance of Al’s Red Hots last September from this post on Chowhound. A few weeks later Cathy2 and I did a drive-by only to find Al’s closed, maybe permanently from the looks of it. Then last week, as part of a slight miscommunication with PIGMON, we ended up at Al’s for a pre-meal meal. I was happy to see that Al’s is Back! and even happier that the hot dogs were very good. This place, with Jimmy’s and Polk & Western, is one of the last spots in the city to get an old fashioned hot dog (none of this tomato/celery salt/poppy seed frippery) and fresh-cut fries. If you care about such things, Al’s is well worth a visit. Did anyone notice if grilled onions are an option on the Polish? Rene G wrote: A few weeks later Cathy2 and I did a drive-by only to find Al’s closed, maybe permanently from the looks of it. I thought we'd been there. It certainly did a great imitation of closed for good. Glad there is now an opportunity to give it a shot. Where's the ketchup? Just kidding. The fries in the pic had good color to em. I think they were cooked long enough. Fresh cut fries are somewhat tempermental. If you drain them after frying and let em sit under the heat lamp, they will go limp. Potatoes harvested towards the end of the season have a higher solid content making it harder to "cook out" the moisture to crisp them up. you can cook em forever and they won't crisp up. Also, using potatoes from, say wisconsin and not from Idaho will lead to a limp fry. I think this might be the case since it looks like they are using the lower end products. By that, I mean plain buns vs poppy seed, 10:1 skinless dogs vs 8:1 natural casing dogs, omitting pickle and tomato. A 50lb sack of Idaho spuds will run between $9-12 while Wisconsin spuds go for $6-7 for the same 50lbs. How much did a dog and fry go for? gp60004 wrote: The fries in the pic had good color to em. I think they were cooked long enough. Fresh cut fries are somewhat tempermental. If you drain them after frying and let em sit under the heat lamp, they will go limp. Potatoes harvested towards the end of the season have a higher solid content making it harder to "cook out" the moisture to crisp them up. you can cook em forever and they won't crisp up. I would normally buy into this assessment. However, from what I recall, the fries has a respectable crispness on the outside and their innards bordered on being ever so slightly raw. Can fries be cooked at higher than normal temperatures, causing a crispness more rapidly on the outside before the entire potato is thoroughly cooked? I yield to the higher forces of hot dog stand-dom. PIGMON wrote: I would normally buy into this assessment. However, from what I recall, the fries has a respectable crispness on the outside and their innards bordered on being ever so slightly raw. • The first, lower temperature fry (ca. 325º or 330º) is longer and leaves the fritten cooked through but not crisp and browned. • The rest period between frying stages allows residual cooking and draining of some of the grease, as well helping to resolve the logistical problem of delivering a sufficiency of well-cooked fritten to lots of people in a short time. • The second, higher temperature fry (ca. 375º) is short and crisps the outside of the fritten which have previously been properly cooked through in the first fry. Decent fried potatoes can be done in one frying but they will not be perfect and it will be extremely difficult to produce very good ones in large quantities. Yet, lots of places use the one fry method which will easily result in fries that are either not properly crisp but cooked inside or not properly creamy inside but crisp on the outside. There seem to be a fair number of humble places around that fry twice but still don't get the best results. These places, it seems to me, are doing something analogous to what restaurants do with pasta (to me, one of the most reprehensible practices in all of cookery), namely to pre-cook the pasta for quick finishing with a second brief cooking to complete orders as they come in. With potatoes, the problem seems to me to be that they just use the same oil at one and the same temperature for both the early prep-fry and for the second fry to finish the order. Maybe that's not really what's being done but that's what the results seem to me to indicate. Another important factor in the textural qualities of a fry and one that is overlooked in most discussions of frit-making is the quality of the potatoes themselves (cf. gp60004's interesting comment about the Idaho and Wisconsin products above). If the potatoes are not a suitable variety and also not properly old and very starchy, the fries will be texturally less satisfying. At least that's the Belgian position on this topic. I've been meaning to ask this for a few days, but is Al's considered the oldest against the Maxwell Street place because Al's has not moved. Nothing aganinst this place, which seems cool, but I do not buy that logic. Does not Jim's at least date back to the 1920's? I do not think that history should stop because the city moved it a few blocks east. Last edited by Vital Information on February 22nd, 2006, 9:01 am, edited 1 time in total. Vital Information wrote: I've been meaning to ask this for a few days, but is Pearl's considered the oldest against the Maxwell Street place because Pearl's has not moved. Just to clarify, the hot dog stand is Al's Red Hots, not Pearl's Place. Pearl's is the soul food place where we had lunch before going to Al's Red Hots. Just to clarify further, Mike G still hates Swedish Bakery. Antonious is correct. A single step fry method can produce limp fries. I always use the 2 step method. While it wouldn't work at a commercial establishment like Gus', has anyone tried Joël Robuchon's french fry technique? A third method, invented by the celebrated French chef Joël Robuchon for the home cook, is to put the sliced potatoes into a saucepan with just enough cold oil in it to cover the potatoes, then cook them over high heat until golden, stirring occasionally. I was planning to return to Al’s once or twice and check some facts before mentioning the place at all but here are a few quick comments (I hope without too many errors!). David Hammond wrote: I'm sure I've blasted past this place hundreds of times (coming back to Oak Park from the loop, I frequently opt for the Mister Toad's Wild Ride feeling of riding under the Lake Street El). That means you also blasted past CJ’s, another place worth stopping for. More later. gp60004 wrote: If you drain them after frying and let em sit under the heat lamp, they will go limp. ... Also, using potatoes from, say wisconsin and not from Idaho will lead to a limp fry. I think this might be the case since it looks like they are using the lower end products. By that, I mean plain buns vs poppy seed, 10:1 skinless dogs vs 8:1 natural casing dogs, omitting pickle and tomato. ... How much did a dog and fry go for? I hesitate to say too much about the fries based on a single visit but those I tried had not been sitting under a heat lamp. I very clearly remember the pack being too hot to rest on my lap while the dog and fries were photographed. I think the suggestion about variability of the raw potatoes is probably right on the mark. I remember a talk with Hot Doug on this very topic as he was getting ready to add the duck fat fries to his menu. I should point out that Al’s fries were better than those at about 98% of Chicago hot dog stands (not a ringing endorsement to be sure) and I wouldn’t be surprised if they are often better than those I tasted. From what I saw at Al’s I’m unable to say if they fry once or twice. As for the dog, I’m nearly certain it was a natural casing Vienna. I’m sure economic considerations enter into their choice of buns etc but I think part of it is doing things the way they always were done. For example I don’t think tomatoes on hot dogs were terribly common in the 1950s. A hot dog is $2.30, burger $2.35, price includes fries and tax. Vital Information wrote: I've been meaning to ask this for a few days, but is Al's considered the oldest against the Maxwell Street place because Al's has not moved. Nothing against this place, which seems cool, but I do not buy that logic. Does not Jim's at least date back to the 1920's? I do not think that history should stop because the city moved it a few blocks east. I was trying not to make any claims about “oldest” myself (at least until I was able to look into the matter a bit more). When I grouped Al’s together with Jimmy’s and Polk & Western I only meant to talk about places with old-fashioned hot dogs and fresh-cut fries. As much as I love Jim’s, it’s not in that group. According to Jim’s website they opened in 1939 (I would have guessed earlier myself), in any case certainly earlier than Al’s. I guess it doesn’t count anymore but Fluky’s opened about 10 years before Jim’s, however they moved a few times. So I think it’s just a matter of how you define “oldest.” As I understand the facts, Al’s seems to have some claim to that title, as does Jim’s, as did Fluky’s. The most important point is, Al’s still makes a pretty good hot dog. Rene G wrote: According to Jim’s website they opened in 1939 (I would have guessed earlier myself), in any case certainly earlier than Al’s. I guess it doesn’t count anymore but Fluky’s opened about 10 years before Jim’s, however they moved a few times. So I think it’s just a matter of how you define “oldest.” As I understand the facts, Al’s seems to have some claim to that title, as does Jim’s, as did Fluky’s. Fluky's still has a stand at Lincolnwood Town Center and is opening another location in Buffalo Grove. I believe these are both owned outright by Jack Drexler, whose father was the original "Fluky" (vs. Western which was owned by a licensee). Even the Berghoff isn't in its original location. All this reminds me, I had my usual cup-o-grits with a slice of cheese at Harry's this morning. Best buck seventy-five breakfast in the Loop, easy. Harry took my cash. gp60004 wrote: I think this might be the case since it looks like they are using the lower end products. By that, I mean plain buns vs poppy seed, 10:1 skinless dogs vs 8:1 natural casing dogs, omitting pickle and tomato. The hot dog I ate at Al's was natural casing, not skinless. Personally I don't recognize skinless wieners as a viable food product. Next time I go I'll try to get a better hot dog pic, but it was windy and cold under the El tracks that day and we were eating off the trunk of my car. Here’s a shot of a hot dog from Al’s showing the umbilicus that’s characteristic of natural casing sausages. Speaking of old hot dog stands, this truck has been parked at a repair shop in my neighborhood (which is, needless to say, nowhere near 76th & Vincennes) for a month. Since 1946 makes 60 years, that's allegedly older than Al's. 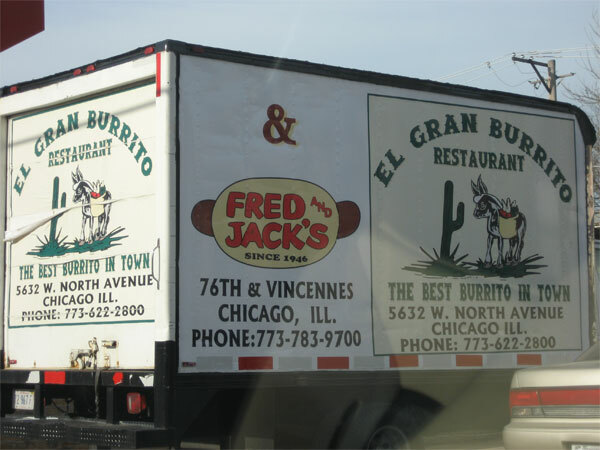 Anyone know Fred & Jack's? Mike G wrote: Speaking of old hot dog stands, this truck has been parked at a repair shop in my neighborhood (which is, needless to say, nowhere near 76th & Vincennes) for a month. Last week Mike sent me an email about Fred and Jack’s. I’d been there before, though not for years, but I didn’t realize it had been around so long. I first heard of Fred and Jack’s from Pat Bruno’s Chicago Food Favorites (1986) in which he recommends the hamburgers and Italian beef. I remember the hamburger being a pretty respectable flame-broiled fast food version. It seemed like a good time to revisit to sample a hot dog and see if maybe we overlooked a good south side Italian beef. It’s now housed in a building that looks quite recent. The dog, ordered with everything, was a skinless Vienna dressed with mustard, onion, sport peppers, cucumber, lettuce, and ketchup. Probably the only time I’ve ever seen that combination. Thankfully the ketchup was applied very sparingly and I must say the whole package tasted much better than it sounds (did I really write that??). The accompanying skin-on fries were quite good. The Italian beef wasn’t terrible but wasn’t terribly special either. The meat had spent too long simmering in the not-too-flavorful juice. Of note was the fact they briefly toasted the bread before filling it. Also the clearly homemade giardiniera was much better than average. Fred and Jack’s has a pretty extensive menu for a hot dog stand. In many ways they’re an exemplary Chicago-style fast food joint, best known for their burgers and fresh fruit milkshakes. I wouldn’t make a special trip for the dog or beef though. While waiting for my order I noticed the grilled steak sandwich and Polish sausage looked pretty darn good. They also have some Mexican items: burritos, tacos, tortas. The owners have a Mexican place on the northwest side (I haven’t visited). So what’s the oldest hot dog stand in Chicago? Depends on how you qualify it. This is not meant to be a definitive list and there may be errors. Corrections and additions are, of course, very welcome. So are you saying that Gene and Jude's used to be where Polk and Western is located now? gp60004 wrote: So are you saying that Gene and Jude's used to be where Polk and Western is located now? That question has come up before and I wish I could answer it. Here’s what I think I know. A sign at Gene & Jude’s reads, “Relished Since 1946 at Polk and Western.” I’m not sure exactly where they were located back then but they probably moved to River Grove around 1955 (see next paragraph), earlier than I would have guessed. Polk & Western opened in 1948. I always assumed they are still in their original location but don’t know for sure. Assuming they haven’t changed their name I doubt they moved far. It seems most likely to me that at one time both Gene & Jude’s and Polk & Western were located in different buildings near the intersection of Polk and Western. Other scenarios are certainly possible. To try to answer some of these questions I looked in some old Chicago telephone directories. There were no listings for either P&W or G&J in the city alphabetical listings for 1956, 1959, or 1963/64. G&J was listed suburban directories for 1956, 1957, and 1958/59 but not the 1954 book. The lack of listings for P&W may not be too surprising; back then many hot dog stands probably didn’t bother with telephones. For example Jim’s, on the corner of Halsted & Maxwell for many decades, cannot be found in any of these directories. Drove by Al's Red Hots yesterday, 3/20/08, around 2pm and it was shut up tight. Mid afternoon on a Thursday seems an odd time to be closed, I wonder if they are down for the count. G Wiv wrote: Drove by Al's Red Hots yesterday, 3/20/08, around 2pm and it was shut up tight. Mid afternoon on a Thursday seems an odd time to be closed, I wonder if they are down for the count. Thankfully, another false alarm. I think Al's might have been closed temporarily for repairs but they were open today, 4/28/08, and doing good business. In this picture from earlier today Al's might not look open but I'm certain it was (note open door).